What 2013 film do you think the Oscars overlooked? 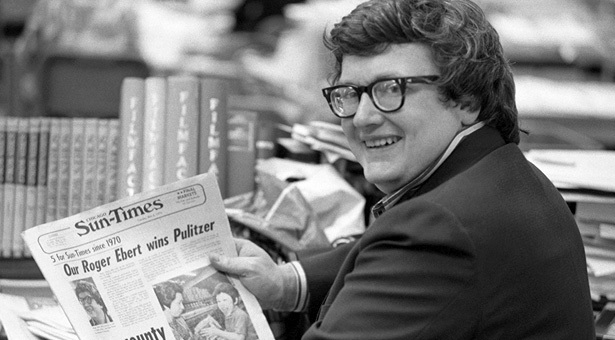 In 1975, Roger Ebert was the first film critic to win the Pulitzer Prize for Criticism. “We started up an email friendship,” says Todd Rendleman, who teaches film history and aesthetics at Seattle Pacific University. He’s talking about his new book Rule of Thumb: Ebert at the Movies, and how the book’s subject — legendary film critic Roger Ebert — came to write the foreward. Rendleman, professor of communication at SPU, is speaking about Ebert the way he speaks about everything related to movies — passionately. In that, he demonstrates just how much he has in common with his mentor and inspiration. He requires no prompting at all to share his experiences and enthusiasm for Roger Ebert’s work. In honor of the career of Roger Ebert — who died of cancer on April 4, 2013 — here are some excerpts from a Response interview with Rendleman that took place June 2012, in a crowded Starbucks on Queen Anne Hill, soon after Rule of Thumb was published. How did Ebert’s criticism change your life? I grew up in a small town in Southern Illinois called Anna, Illinois, right on the Kentucky and Missouri borders. I loved to go to the movies when I was growing up. A lot of my friends liked to go to the movies, but nobody really loved to go to the movies and talk about them so much as I did. For me, Roger Ebert in particular was a consolation. He was somebody I could always go to and have something thoughtful to read. It started with television — "Sneak Previews," with Roger Ebert and Gene Siskel in the mid- and late ’70s. I didn’t read Ebert at that time. My father’s newspaper was not a Chicago paper, it was the St. Louis Globe-Democrat, and later the St. Louis Post Dispatch. So I read St. Louis critics like Harper Barnes and Joe Pollock. They were really good writers and I enjoyed them a great deal. I didn’t start reading Ebert until 1985, which is when he published his first collection of reviews. I was in the eighth grade, just going into high school, at that point, and that was right when our family got our first VCR. That just opened up a whole world to me. How then did you start reading his work? The convention was held on the campus of Eastern Illinois University and it was a good time. But I also remember being lonely. I remember going to the university library and I was eager to read the Chicago Sun-Times. And they had back issues, so I kept reading and reading Ebert. And that’s what Ebert was to me: a great writer, and someone to argue with about the movies. Whenever I could, I’d seek out his [newspaper] writing. Avidly. But the real gift was that annual collection, where I could read everything that he thought about the movies of that year. And it even included many movies from previous years as well. My parents would buy that for me as a Christmas gift every year throughout high school. Your book, Rule of Thumb, is a very personal tribute to Ebert. I love how it begins. Why did you choose that particular story? The book opens with a memory that people seem to be tickled by. I was in high school. My parents drove me three-and-a-half hours north to Champaign, Illinois, where Ebert grew up, and where my brother was a junior at the University of Illinois. Those were fun trips because my dad would buy me Friday’s edition of the Chicago Sun-Times, but he would also buy me the thick Sunday edition. The Sunday paper would have interviews that Ebert did with an actor, and it would also have these capsule reviews. That was great fun for me —I could go and catch up with all these blips, these two-sentence summaries of what Ebert thought of a ton of movies. On that particular weekend, we were on a mission because Barbet Schroeder’s Barfly had come to theaters, and I really loved Faye Dunaway and Mickey Rourke. Ebert was off his nut about this film. He was so excited about this movie, and was already describing it in ways that you knew it would be on his top 10 for the year. I wanted to see this quite badly. It was playing at the New Art Theater in Champaign, IL, which, of course, my brother – who’s big sports fan - had never been to in three years of going to school there. It was an off-the-beaten-path theater. I begged my parents to go to the 9 p.m. showing. They reluctantly agreed to go. I’ll let people read more about it in the book, because I go into detail about what that experience was like. That was just one experience of how Ebert’s enthusiasm fanned my own into flame. Ebert got my entire family to go see a movie that we didn’t have access to in our small town. None of us would have seen Barfly in a theater if those dominos hadn’t fallen. Do you have a favorite Roger Ebert review? I think it says a lot about Mr. Ebert. When he quotes another critic, he will do it more often than not in a respectful way. His paying homage to her opened up her writings to me. I’m very grateful for that. Do you remember a time when you strongly disagreed with him? One movie I disagreed with him about was Splash, Ron Howard’s film, which I thought was cheerful and delightfully romantic and just great fun. Tom Hanks played a young man who falls in love with a mermaid, played by Daryl Hannah. I grew up watching SCTV and John Candy and Eugene Levy were also in that film. I really enjoyed the comedic talent that went into making that movie. Ebert was very negative toward it. He gave it a star and a half! I liked Tom Hanks a lot. He was one of the reasons I was excited to go to the movies growing up. If you read Ebert’s review, this was a case where his own personal feelings leak a little bit. One of his complaints was, “Wouldn’t it have been great if the mermaid had fallen in love with this overweight loser with lust in his heart, and his more traditionally handsome friend had to cope with that?” I argue that there was a type of self-defense going on there. I think Ebert was projecting himself onto John Candy. What’s something you learned from Ebert that helped you appreciate what you were seeing? Ebert coined “Ebert’s Law” many years ago. I was introduced to that at a young age, and I’m glad that I was. Ebert’s Law says that “A movie isn’t about what it is about — it is about how it is what it’s about. He’s talking about the difference between content and style. It’s not just subject matter, but how does the movie engage that subject matter? And on what terms? That simple principle was very thought-provoking to me. I return to Ebert’s Law a lot in my book . For example, a chapter called “Cross References” addresses the idea, as I examine Ebert’s attitude toward spirituality and religious images in American movies. How would you describe Ebert’s attitude toward faith? It’s something that’s very unique about Ebert. He’s very sympathetic to portrayals of Christian devotion and expression. I think he bucks a stereotype of film critics. … There’s an unwritten rule that critics are at best humanistic and inherently skeptical of any religious belief. Ebert, because he grew up in the Catholic church and was taught by nuns, has incredible reverence for the formation that he encountered in his Catholic schooling experiences. He has only positive memories of that, and he really feels that his moral engagement in the world is rooted in those theological discussions that they started their days with in school. He would not have described himself as a practicing Catholic, but he would say that he’s grateful for the formative role that the church played in his life. I think you see that in his criticism very clearly. I spotlight that in the book, and I’m pleased to do that. A lot of people don’t talk about that aspect of his critical ethos. What’s your approach to teaching about movies? Often, a student will sign up for my class and think, “Oh, great, a movie class. That’ll be fun and relaxing.” And they can be challenged pretty quickly because we do a lot of thinking and writing and reading about the films that we watch in my film courses. So it’s energizing, but also a tremendous amount of work. You’re giving students opportunities to write, and inspiring them to become better writers. The good news is that they often do come in with a certain amount of passion — often toward movies in general. A lot of young people love movies. When you ask them to really invest in that, because they’re already in love with the subject, the hard analytic work they do is a little bit more bearable. I like introducing students to older movies. They come in thinking that they won’t like older movies simply because they haven’t been made in their lifetimes. They imagine that they’ll be less interesting. In reality, it’s just the opposite, when they realize that the characterizations are much richer and more complex than they expect. Moviegoers can be cynical about criticism. How do you address that? It’s also why I was more drawn to Mr. Ebert than Mr. Siskel. Gene Siskel would acknowledge that his approach was more dispassionate, more skeptical, more sober. That was fine. He could be whatever he wanted to be. But I think that in terms of being drawn to their criticism and their points of view, Ebert … was more of a cheerleader. That’s what Siskel always accused him of … “You’re too excited about movies, you’re too much of a cheerleader.” But I would rather have that [enthusiasm], and be able to temper it, than be somebody who is constantly leaning back and holding art at arm’s length. What part of the book is most important to you? My favorite part of the book is the epilogue, because I return to a couple of obituaries that Ebert wrote in the summer of 1997. Robert Mitchum passed away, and the very next day Jimmy Stewart. And Ebert wrote beautiful “In Memoriams” for both of these actors. A few days later he wrote another essay called “Mitch and Jimmy: Some Thoughts.” So he really wrote three essays about these men — all on deadline — within less than a week. And they’re very thoughtful and complex appreciations. But the third was prompted more by the sense in the press that Stewart’s death had overshadowed Mitchum’s. Of course, Stewart’s career had [overshadowed Mitchum’s], if you were going to compare the men, and the way that American moviegoers responded to them. And Ebert’s third essay is a celebration of James Stewart as well as a defense, in a way… a reminder of how special Robert Mitchum was to American cinema. Through the lenses of those obituaries, I’m able to tie together some threads that I think are special about who Ebert is as a writer. Will we see another reviewer rise to the prominence of Roger Ebert? If the answer to that is “no,” it’s not “no” in a pessimistic manner. If the answer is “no,” it’s because we have a different media environment today. Siskel and Ebert couldn’t come to the fore today in the way that they did in the mid-1970s. There are so many choices in the media landscape. I think Ebert and Siskel and others broke open the idea of writing and thinking deeply about film as part of your life and perhaps as part of your livelihood. They have been great models for that. But at the same time, pursuing a path that led to … their impact is very hard to accomplish today. Audiences are so dispersed, and there are so many media outlets and entertainment choices, on television or online. The era of Siskel and Ebert reigning — we’re not likely to see that again, and not because there aren’t intelligent people talking about movies. They’re just not going to be in everybody’s living room every Sunday at noon.